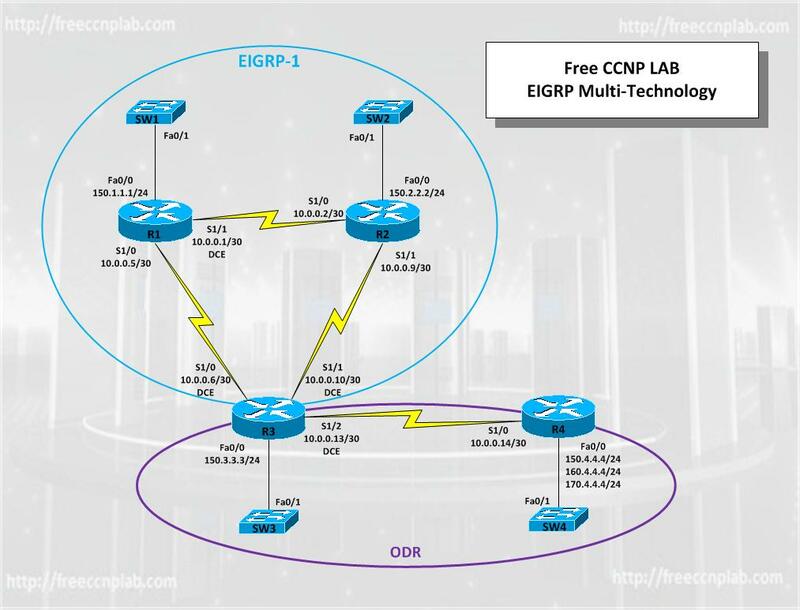 In this Free CCNP Lab we will learn to understand EIGRP implementation and configuration of EIGRP and ODR in Cisco IOS routers. We will also learn redistribution and path control. In addition, we will then learn to verify and test our implementation of these technologies. This lab has been created using GNS3 and the topology and solutions are provided. This lab can also be completed using real hardware using the network diagram as a guide. I have used Cisco 3640s with a 4 port serial interface installed. You may substitute other devices or interfaces but you may need to update the port information. Unfortunately this lab cannot be completed with Packet Tracer due the limitations of Packet Tracer. Redistribute routes between EIGRP and ODR. Configure the IP address, and subnet on the Ethernet interfaces of all routers as shown in network diagram. Configure the IP address, and subnet on the serials interfaces of all routers as shown in network diagram. Configure the clock rate on R1 S1/1 to be 2000000. Configure the clock rate on R3 S1/0, S1/1 and S1/2 to be 128000. Insure the state of the Ethernet and serial interfaces is up. Configure EIGRP for AS 10 as shown in the network diagram; DO NOT advertise the 10.0.0.12/30 subnet between routers R3 and R4 or the 150.3.3.0/24 LAN subnet connected to R3 via EIGRP. Ensure that no EIGRP packets are sent or received on any interfaces for which EIGRP is enabled but which will have no EIGRP neighbors. Verify your configuration. Configure ODR between R3 and R4. Verify that R3 receives the 150.4.4.0/24, 160.4.4.0/24, and 170.4.4.0/24 subnets connected to R4s LAN interface via ODR. Configure your network so that all the other routers can reach the 150.4.4.0/24, 160.4.4.0/24, and 170.4.4.4.0/24 subnets configured on R4. These prefixes should be assigned a route tag of 150, 160, and 170, respectively. Ensure all routers can ping each other following this configuration. Verify your configuration using the appropriate commands. Configure your network so R1 prefers the path via R2 to reach the 150.3.3.0/24 and 150.4.4.0/24 subnets. All other routes should follow the best path. Do NOT modify EIGRP metrics in any manner to complete this task. Verify your configuration.